I am not a professional cake decorator, but I enjoy making simple DIY cakes for my family celebrations. I love when my homemade cakes match perfectly with my party theme, don't you? So, today I am sharing more than 20 easy-to-make cakes that are sure to impress party guests and add an element of fun to your next party. You are going to be shocked at how simple these cakes are to bake and decorate. 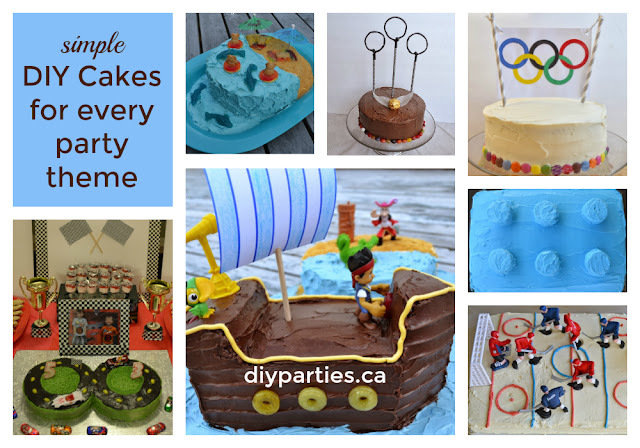 Many of them use basic cake mixes and store bought icing! Bowling Party Cake - These cakes are super cute, and they allow you to have two different flavours of cake for party guests. 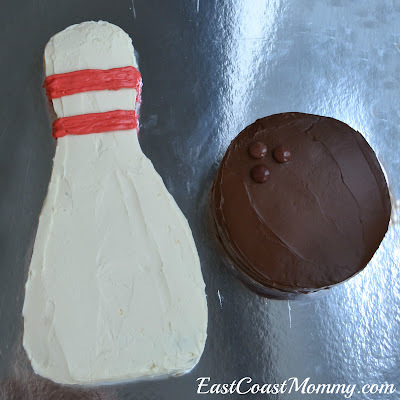 Carve a bowling pin from a rectangular cake and a bowling ball from a round cake. 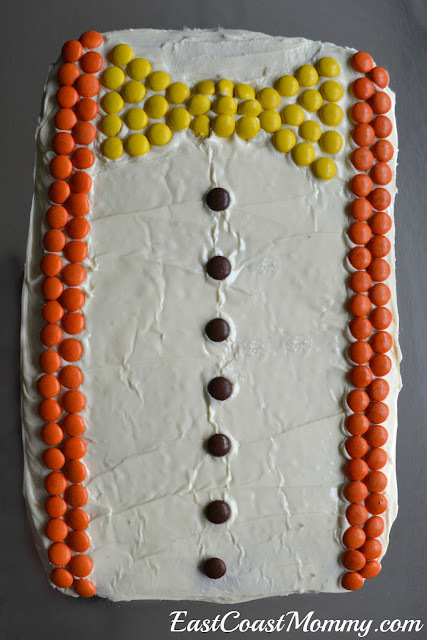 Apply a crumb coat, refrigerate until the crumb coat is firm, frost with white and chocolate icing, and add embellishments (m&ms and red icing). 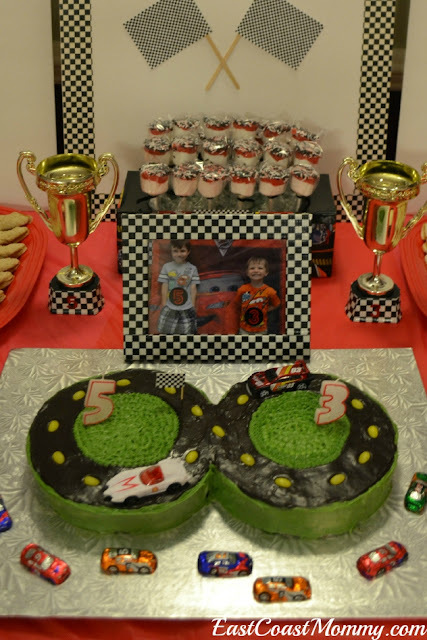 Cars Party Cake - Start with two 8" round cakes. Then, create a track using chocolate icing tinted with black food colouring. Fill in the "grass" with green icing, and add some yellow jelly beans for the lines in the road. Finish with two race car "dinkies" and a small checkered flag taped to the top of a toothpick. Circus Party Cake - Bake and frost a regular, round (double layer) cake. Then, use straws, a paper carousal top, and some animal cracker cookies to create a simple carousel cake. Easter Party Cake - This cake is super-simple! Bake and frost a regular, double-layer cake. 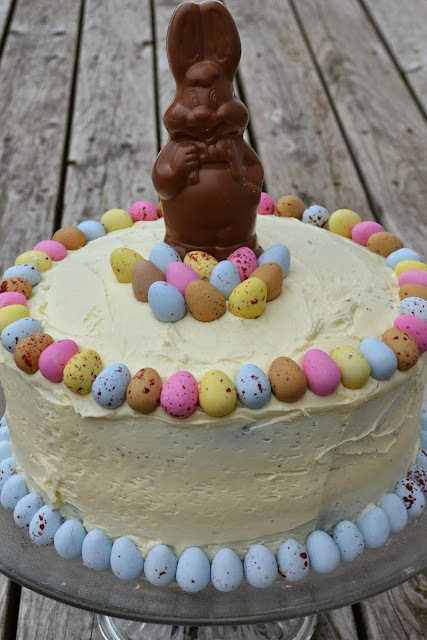 Then, use candy-covered chocolate mini eggs to trim the cake, and add a chocolate bunny to the top. Father's Day Cake - Transform a simple sheet cake with a little imagination and 4 boxes of Reeses Pieces. The kids can help with the decorating too! 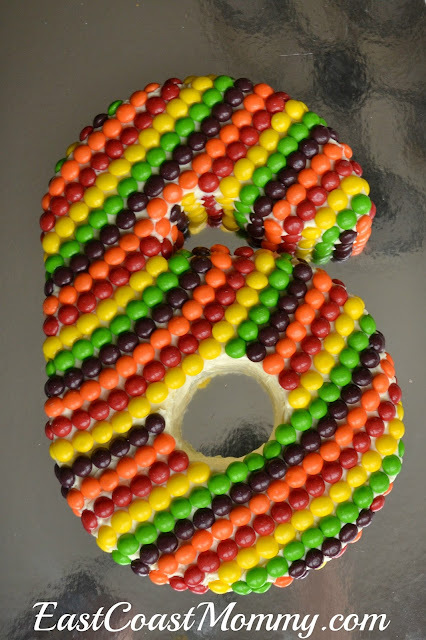 Generic Skittles Cake For any Party Theme - To make number cakes, start with basic cakes (round or square... depending on the number you are making). Then, carve the cakes, cover with icing, and decorate with Skittles. It's a time-consuming process, but the result is stunning! Halloween Party Cake - Start with a cake mix and bake for 70 minutes (at 350 degrees) in a greased, oven-safe glass mixing bowl. (Check it after 45 minutes, and then increase the cooking time by increments of 10 minutes until a wooden skewer comes out clean.) 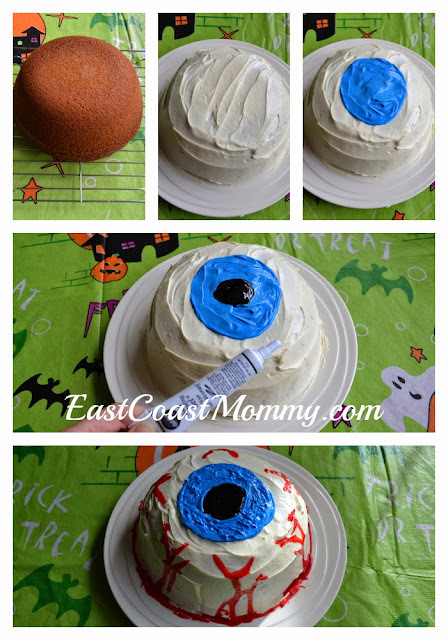 Then, let the cake cool, frost it with pre-made white icing, create an eyeball with blue icing, and use black decorating gel to make the pupil of the eyeball. Finish with red decorating gel "veins and blood". 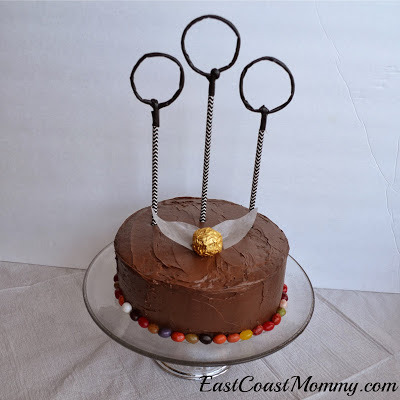 Harry Potter Party Cakes - To make a quidditch cake: Make a regular cake, and add goal posts made from straws, electrical tape, and pipe cleaners. Finish with a golden snitch made from a chocolate wrapped in gold foil with wax paper wings. (And for a touch of colour, you can finish by adding some "every flavour beans" to the bottom of the cake. To make a crest cake: Start with a basic rectangular sheet cake, and carve it into the shape of a crest. 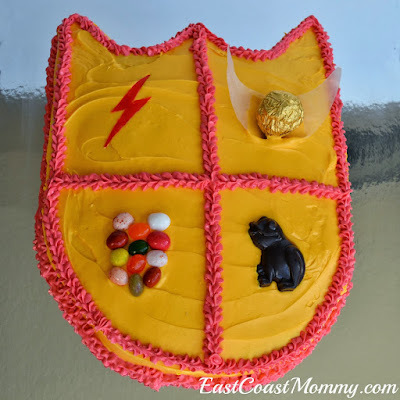 Do a crumb coat, cover the cake with yellow icing, pipe on some red trim, and then I added some fun "Harry Potter" items -- a fruit roll-up scar, a foil wrapped golden snitch, some every flavour beans, and a chocolate frog. 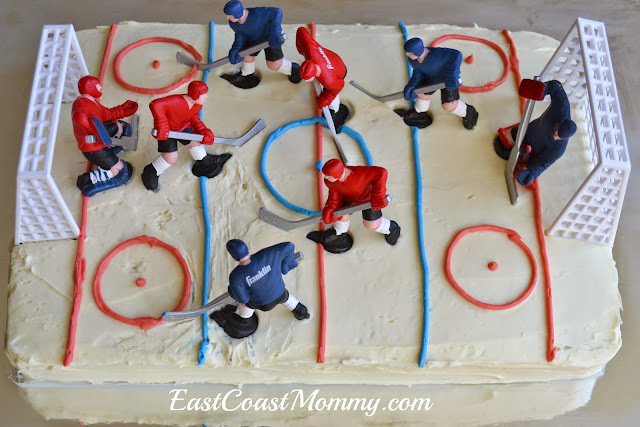 Hockey Party Cakes - Start with a basic 9X13 slab cake, and add hockey players. They can be purchased, or you can use toys that have on hand. 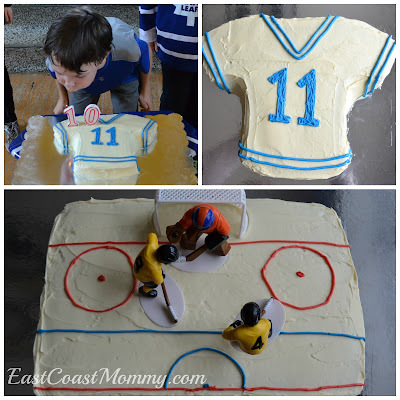 A simple jersey cake is fun too! 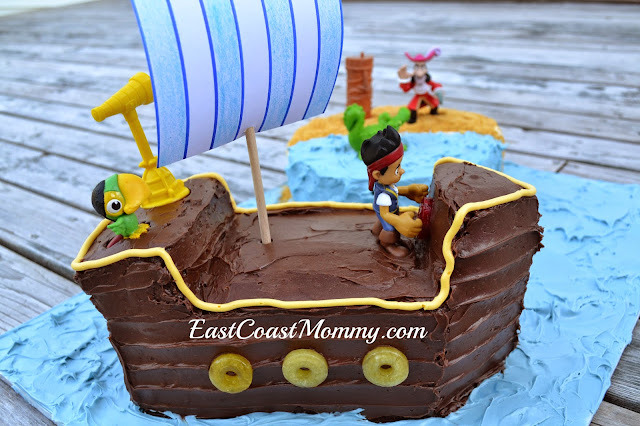 Jake and the Neverland Pirates Party Cakes - This pirate ship cake is easier to make than it looks. Start by constructing the boat using the photos below and the tutorial you can find here. Then, to decorate the boat: frost the cake with chocolate icing, use a knife to carve "planks" into the cake, trim the boat with yellow icing, and add a red lifesaver steering wheel and yellow lifesaver windows. Finish the boat by adding a paper sail on a dowel and some little plastic toys. 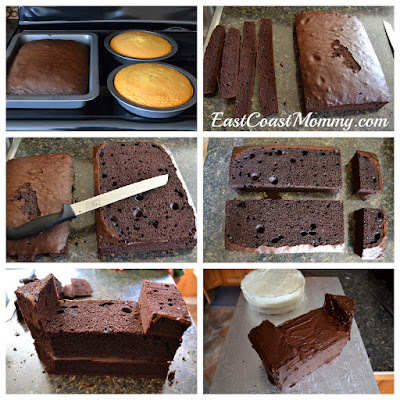 You can also create an "island cake". Decorate half of a round (double layer) cake with blue icing, and use graham cracker crumbs to add "sand" to the other side. Finish with little plastic toys. 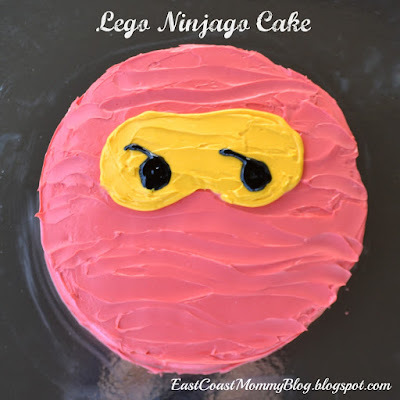 LEGO Cakes - To make a LEGO Ninjago Cake: Start with a double layer round cake, frost the cake with red icing (not too smooth so it looks like cloth wrapped around his head), pipe on a yellow face, and I add some black "ninja" eyes (with black gel icing). 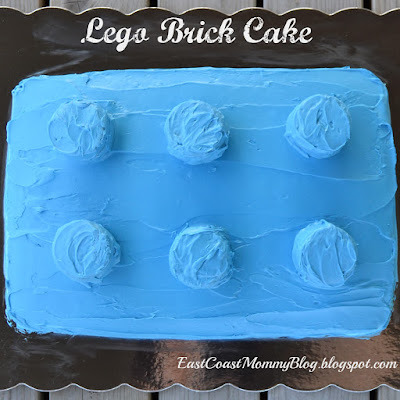 To make a simple LEGO brick cake: Start with a rectangular cake, frost the cake with blue icing, and add six (double stacked) Oreo cookies covered with blue icing. Monkey Party Cake - Start this simple monkey cake with a round cake and two cupcakes (for the ears). Frost the cake with chocolate icing, and add additional details with a piping bag. Music Party Cakes - To make a drum cake: start with a basic round, frosted (double layer) cake. Decorate the sides with Smarties and Ovation (mint and chocolate) sticks, and top the cake with two lollipop "drum sticks". 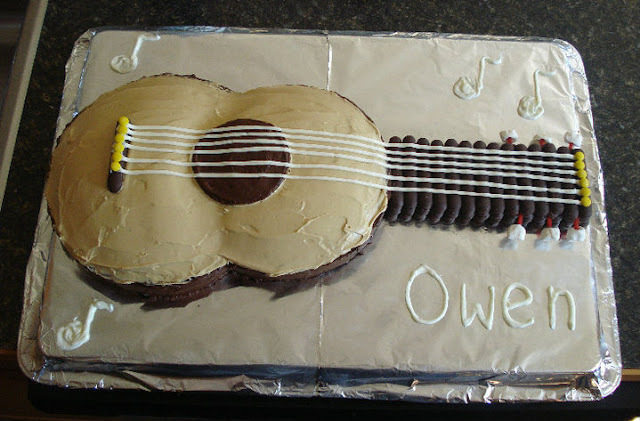 To make a guitar cake: follow the tutorial you can find here. 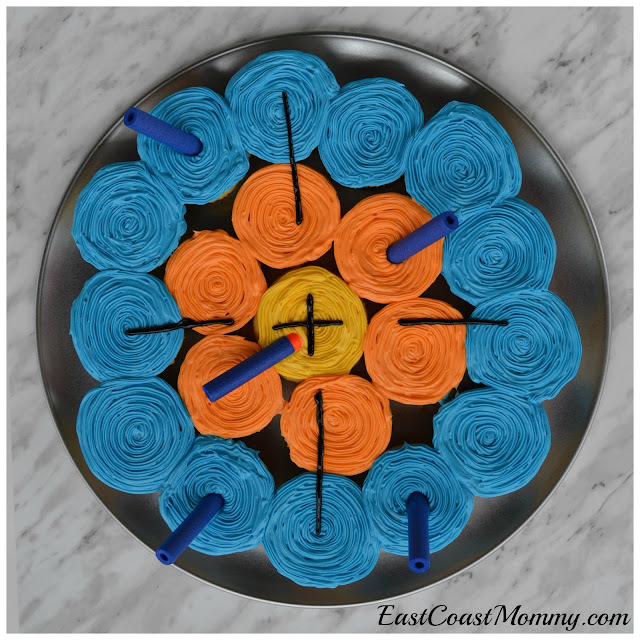 NERF Party Cupcakes - Decorate cupcakes with yellow, blue, and orange icing. Then, arrange the cupcakes on a try to resemble a NERF target. Embellish with some black icing and clean NERF bullets. 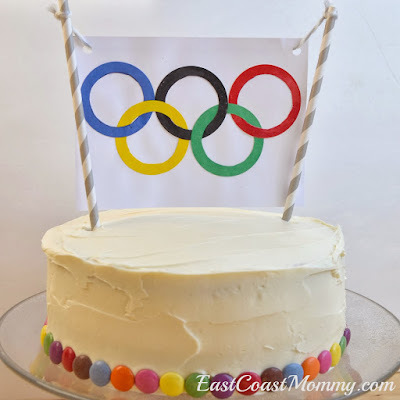 Olympics Party Cake - Print Olympic rings onto a piece of card stock, attach to paper straws, and insert into the top of a plain cake. Finish by adding colourful candies to the base of the cake. 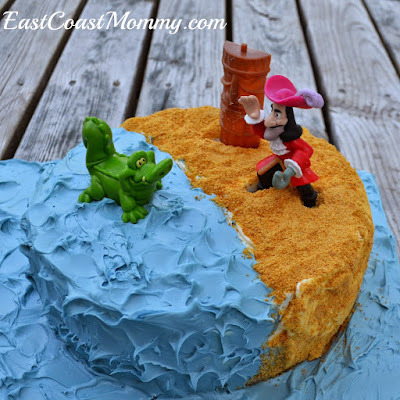 Pirate Party Cake - Use the tutorial you can find here. 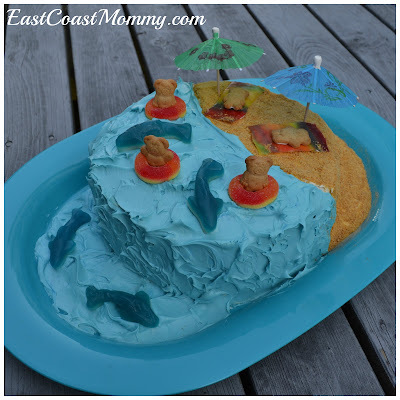 Pool Party Cake - Start with a simple, round (double layer) cake. Frost have the cake with blue icing, and cover the other have with graham cracker "sand". 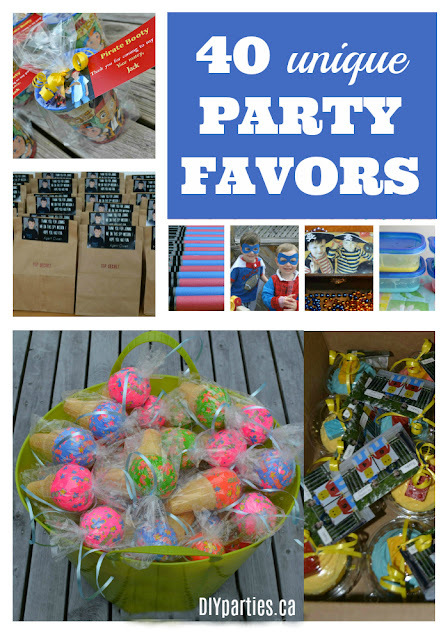 Decorate with fruit leather towels, candy ring floaties, candy sharks, drink umbrellas, and teddy bear cracker/cookies. 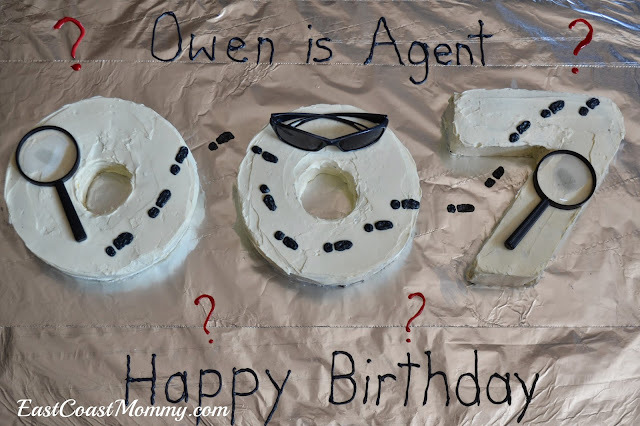 Spy Party Cake - To make a "007" spy cake: start with dense cakes that will be easy to carve. (I used Duncan Hines Cake mixes, but I used 2 tbsp less water and half the oil called for in the recipe in order to make the cake more dense and easy to work with.) Then, carefully carve out the numbers, cover them in a crumb coat, and stick them in the refrigerator. When the icing is firm, add a finishing coat of frosting. Then, decorate the cakes with dollar store magnifying glasses, sunglasses, and black icing footprints. 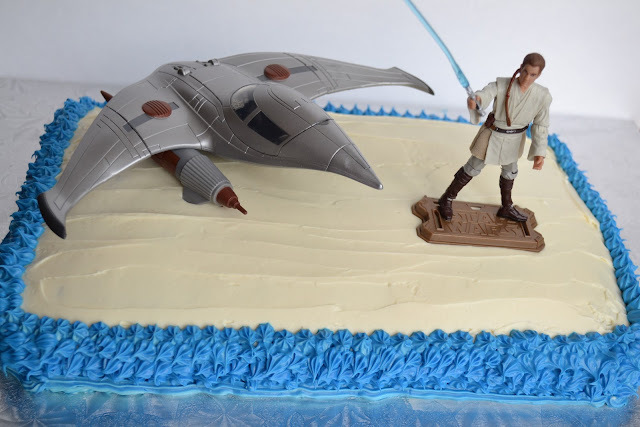 Star Wars Party Cake - Transform a plain, homemade slab cake into a Star Wars cake by adding new toys to the top. The birthday boy/girl will love the cake... and the extra gift! Super Hero Party Cakes - A simple round layer cake can be easily transformed into a super-fun Super Hero cake. Frost the cake with red icing, use black icing to draw a web, and add new Spiderman toys to the top. Valentine's Day Party Cake - Simple Valentine's Day cupcake parfaits can be a wonderful way to celebrate someone you love. 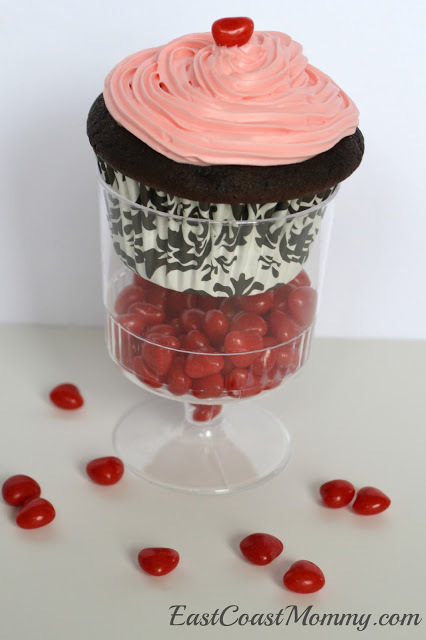 Put some candies in the bottom of a glass, and insert an adorable decorated cupcake. 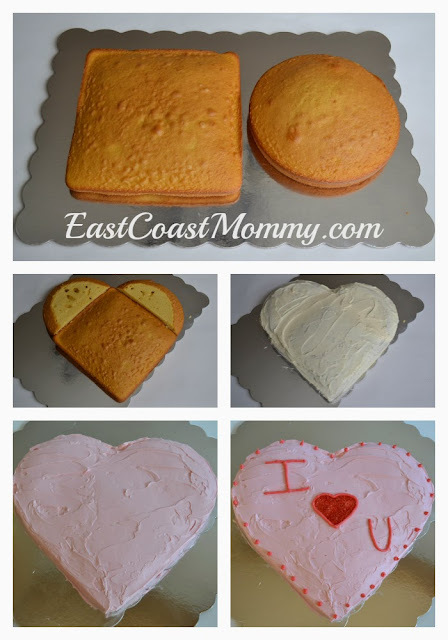 A heart cake made from one square cake and one round cake can also be fun. Find the full tutorial here. I have never taken a cake decorating class, so I guarantee you don't have to be a pro to make these cakes. Homemade cakes are a wonderful way to show someone how much you care, don't you think? Just remember: it's not about perfection... it's about making an effort for someone you love. Your cakes are amazing! 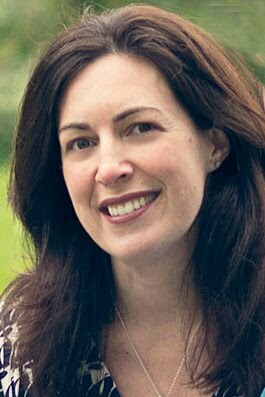 I love the new blog, Gina! Thanks, Heather! Most of them were made with cake mixes. Who doesn't love a good short cut?